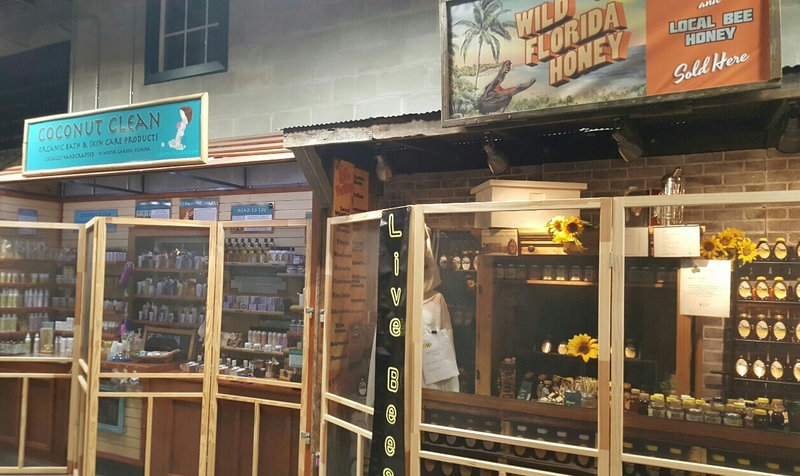 ​One of the best little places to go in central Florida is historic downtown Winter Garden. It’s well off the beaten path, at least 30 minutes away from the nearest theme park and awfully close to Lake County. It’s delightfully quaint, lined with huge trees, local businesses, and the West Orange Trail cutting right through the middle. I used to ride that trail for hours in my triathlon days. If you go on the trail towards Clermont, past the theatre, past Birket Engineering (lots of awesome theme park stuff in their windows), and past City Hall, there’s a newer building on the left. It’s big, relatively new, and fits right in with the rest of the architecture. It’s the Plant St. Market, home to the booming Crooked Can Brewing. Interestingly enough, Crooked Can owns the entire Plant St. Facility, and it’s worth it to come early enough to take a look around. It’s a fantastic little farmer’s market, with wood-fired pizza, clothing, local honey, butcher shop, and more. But all you have to do is look at the one end of the building. 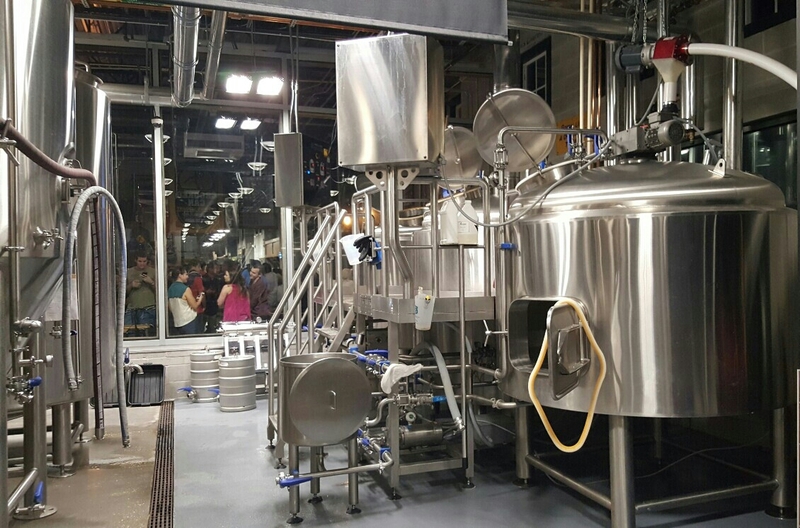 There’ right behind the picture windows, sits the 15 bbl system Crooked Can uses to brew the beers currently being distributed in cans and kegs across Central Florida. 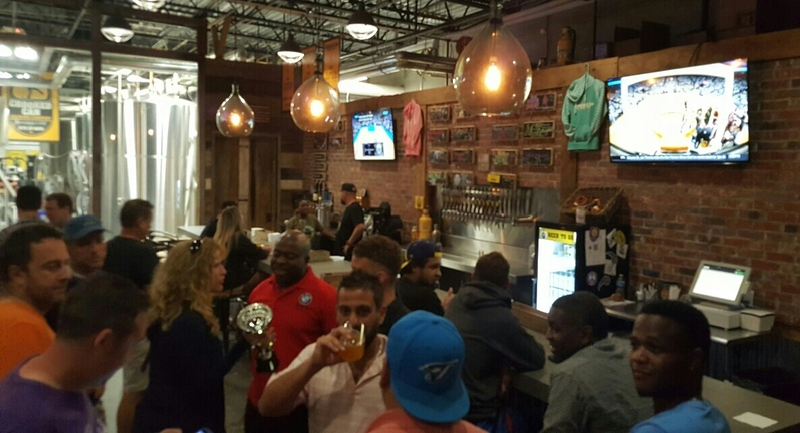 Crooked Can was the brainchild of a few friends living in West Orange County, using their skills honed in real estate, foodservice, and monkey business (one of the co-founders was on the Kong production team at nearby Universal Orlando) to find the perfect location and sources to make the venture thrive. Brewing on that system are two notable, bearded guys: the brewmaster is Kent Waugh, whose brewing career included notable stints at Boulder Beer and Big River Grille at Walt Disney World. Helping him is Head Brewer Nolan Clark, who spent a lot of his time at Karl Strauss on the west coast. I visited at the invitation of Assistant General Manager Ryan Gossett, who put me in touch with their manager on duty, tour guide, and great beardholder Colin. 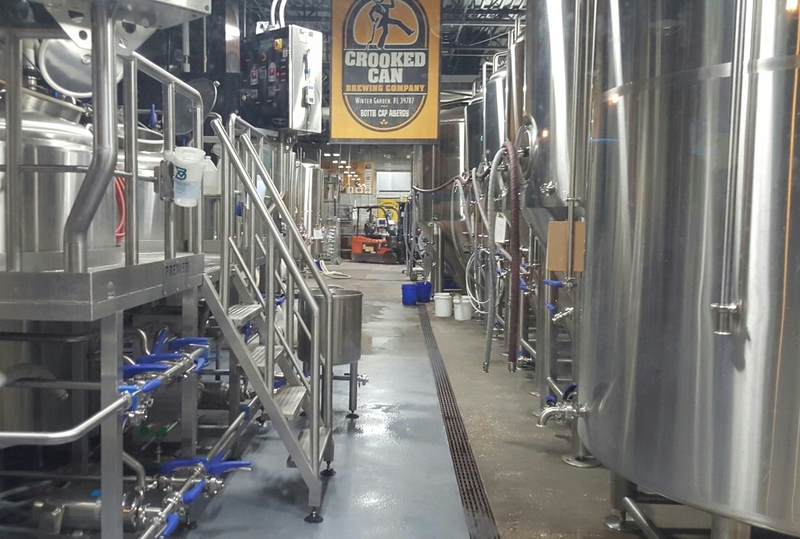 Taking a look around the production facility, it’s quickly apparent that Crooked Can needs to grow. Every inch of their space is maxed out, and with the reach and buzz their beers are getting, that space needs to grow as soon as possible. This is in the works, apparently, with another building for production in the works behind the current Plant St. Market, and another admin building to go up on the other side of the Trail. 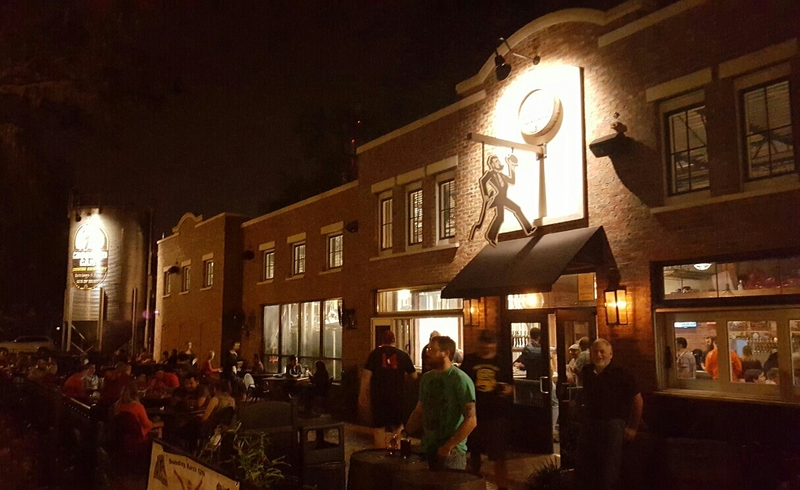 Crooked Can was built to immediately become a part of the fabric of downtown Winter Garden, and Colin told of how fast that goal was accomplished. Across the city-owned parking lot, in the shadow of City Hall, is Winter Garden’s weekly farmer’s market. It quickly became standard for regulars to shop at the market, then come over for a bite and a pint. So what’s in those pints? 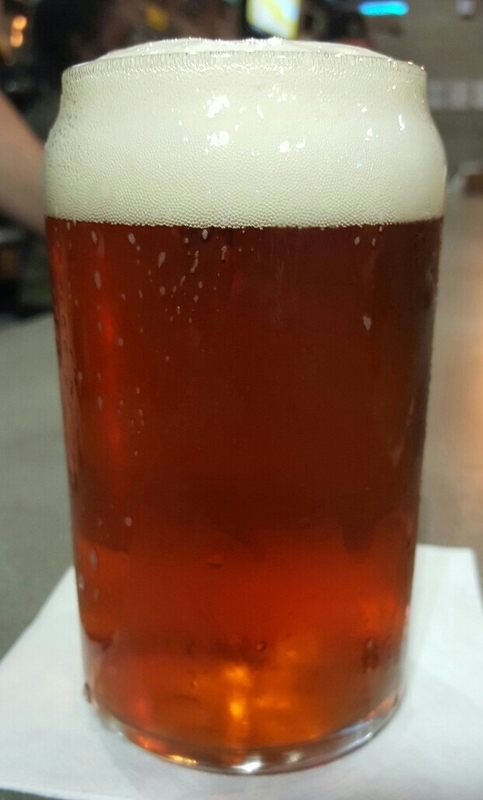 I started with Steam Jack (California Common, 5.2% ABV), a self-styled ‘Florida Common’ produced in conjunction with Florida-based ABC Fine Wines & Liquor. ‘Jack’ refers to ABC founder Jack Holloway, whose grandson collaborated in brewing the beer. It’s a nicely textbook Common, with a pronounced earthy hoppiness and a light, crispy malt backbone. 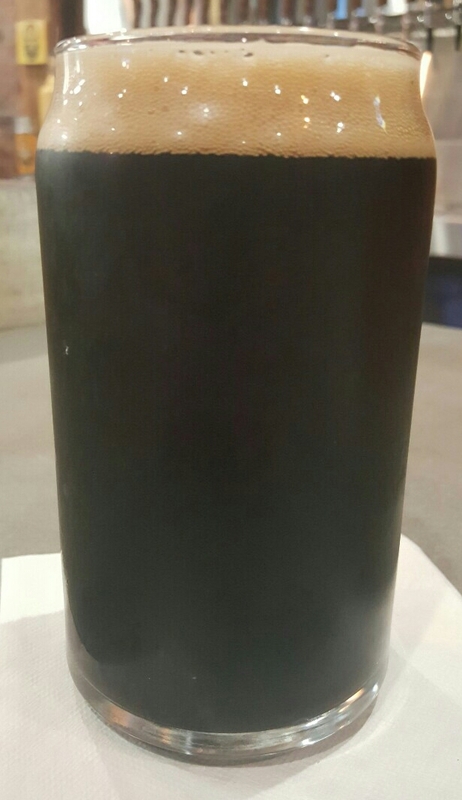 The other beer I tried while I was there is the very simple, very unassuming Taproom Stout (Stout, 4.75% ABV), bronze medal winner at the Best Florida Beer championship. Colin and I were both in agreement about the beer and how it can really be used to dissuade the tired and overdrawn tale that all dark beers are heavy. Taproom is one of the lightest beers in the tap room, with a good, roasty body, moderately carbonated so it dances on your tongue just a bit. But it’s not heavy at all. It’s light and buoyant and could be readily sessioned, even on the warmest of Florida days. That medal was definitely well deserved. 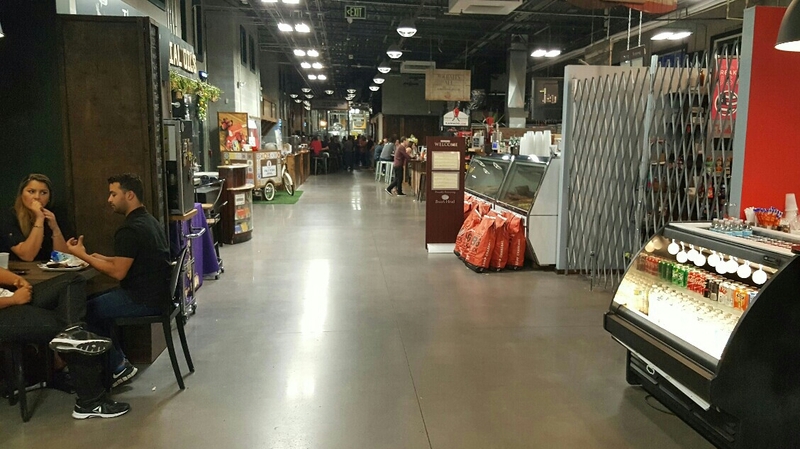 There’s a lot of good things coming out of that market on Plant St. 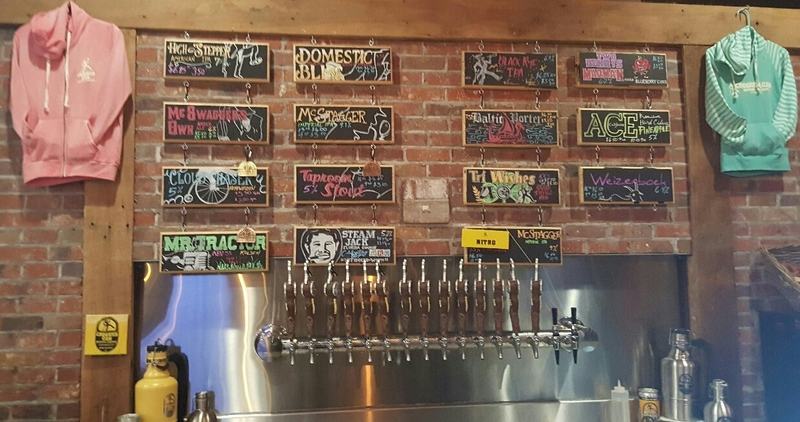 I would fully expect that, in the near future, more places in the state will be able to enjoy all of the good things coming out of Crooked Can. In the meantime, going to Winter Garden is the best thing to do. You might not want to leave, though.